The view from the front-of-house position at Rose Heights Church in Tyler, Texas, featuring a Roland M-5000 OHRCA Live Mixing Console. allowing extensive networking and streaming capabilities. 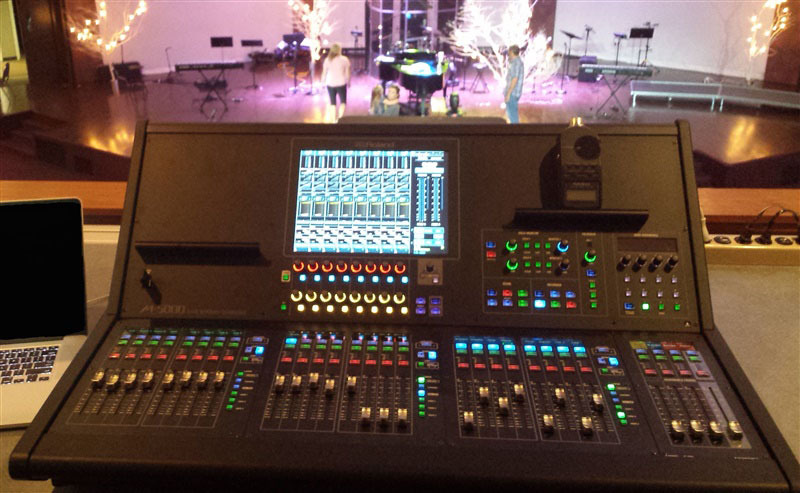 Los Angeles, CA, October 19, 2015 — When Shane Weber of Web Feat Productions, a media consulting firm that specializes in serving churches and not-for-profit organizations, was brought in to spec solutions for a new FOH console at Rose Heights Church in Tyler, Texas, he focused on his normal priorities: “When I come in, I really want to make a functional system for people to walk up to. It’s going to do everything they want it to and more, and it’s going to be as simple as I can make it.” Once a church makes an A/V upgrade a priority, a consulting or installation firm sometimes specs solutions that are too engineering-based and difficult for Sunday volunteers to wrap their minds around, he notes, again emphasizing the elegant simplicity that complements the functionality of a well thought-out infrastructure. With these things in mind, to Weber the solution was obvious: the Roland M-5000 OHRCA Live Mixing Console. The M-5000 fully integrates the M-48 personal mixers with the M-48 manager, with easy setup and control of all M-48 Personal Mixers directly from the M-5000. The M-5000 and M-48 integration includes an engineer’s monitor function that allows the M-5000 engineer to listen and adjust the mix of any musician’s M-48, the ability to synchronize console scene recall to memory preset recall on the console, and the ability to create two separate M-48 worlds from one console, allowing a different and unique selection of 40 sources to be sent to each M-48 world. Photo caption 1: The view from the front-of-house position at Rose Heights Church in Tyler, Texas, featuring a Roland M-5000 OHRCA Live Mixing Console. Photo caption 2: The view from the front-of-house position at Rose Heights Church in Tyler, Texas, featuring a Roland M-5000 OHRCA Live Mixing Console.